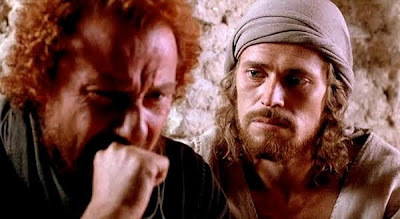 From a purely cinematic standpoint, what I find most interesting is how much The Last Temptation of Christ, a film which diverges so greatly from the Bible in its depiction of Jesus (Willem Dafoe), seems to owe so much (or be responding to) the far more reverent King of Kings (1961). Many criticized that film for being a rather subdued interpretation of the Gospels, its version of Jesus (Jeffrey Hunter) being almost a spectator in the revolution he inspires. Perhaps more was expected because of the reputation of its director, Nicholas Ray (Rebel Without a Cause), as an advocate for young non-conformists. Scorsese's Jesus seems more like the extremist many might have expected from Ray, wild-eyed, prone to confusion due to the cacophony of contradictory voices that speak to him in his head, fearful of the sexual tension that has emerged in his relationship with Mary Magdalene (Barbara Hershey). In contrast, Ray's Jesus seems preternaturally calm with his mission, comfortable with an almost precognitive awareness of his fate. He's nothing like Scorsese's Jesus, who might as well be admitting he's making things up as he goes along when he tells his loyal disciple Judas Iscariot (Harvey Keitel), "God only talks to me a little at a time and tells me as much as I need to know." 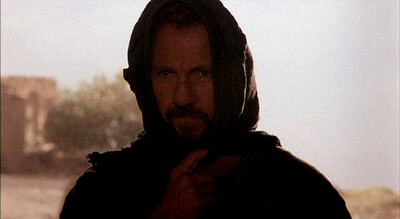 The Last Temptation of Christ's portrayal of Judas also seems influenced by Ray's film. As I discussed in an article I reposted earlier this week, the Judas (Rip Torn) from King of Kings is conflicted. A Jewish nationalist, Ray's Judas is torn between his loyalty to Barabbas (Harry Guardino), an extremist with no compunctions about using violence to overthrow the Roman conquerors, and respect for Jesus, his progressive Rabbi who seeks the grander goal of freeing men's spirits through nonviolent means. Scorsese's Judas conflates the Judas and Barabbas characters of Ray's movie, so that Judas's conflict becomes an inner one. Part of him still believes Jews will only regain their homeland through violent revolt, while another part of him sees the value in winning over hearts and minds the way Jesus teaches. This close association between Judas and Jewish nationalism is illustrative of what has long been a thorny issue. Many have speculated whether Judas is actually a coded metaphor implicating the Jews in the betrayal and subsequent execution of Jesus, the very foundation of anti-Semitism, more in line with the Judas seen in Mel Gibson's The Passion of the Christ (2004). 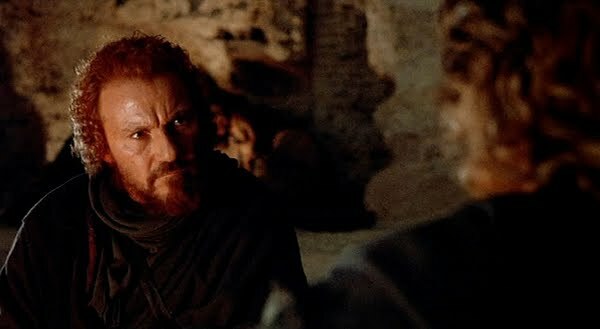 The Judas of The Last Temptation of Christ, as written by the source novel's author, Nikos Kazantzakis (and adapted for the screen by Paul Schrader), is more complex. His personality seems informed by an idea originating from the Gospel of Judas, a Gnostic gospel which posits that Judas should not necessarily be reviled as a traitor. Perhaps Judas heroically sacrificed his immortal soul in betraying Jesus, facilitating his death and eventual resurrection and the deliverance of Man. 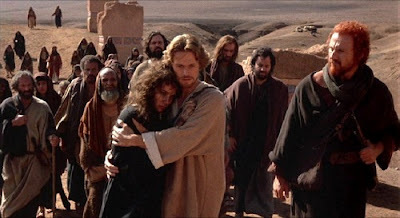 In The Last Temptation of Christ the "Judas Kiss" that signals Jesus to his Roman captors is a pained act of Judas's regret as much as it is an act of betrayal. Scorsese's avoidance of an onscreen death for Judas further cements the notion of Judas's absolution. By withholding his ultimate fate, any kind of retribution or redemption for his (at least on the surface) traitorous act, we are left to ponder whether this Judas might actually be acting in accordance to God's plans. With all of the attendant furor over The Last Temptation of Christ's illustration of an alternate life in which Jesus marries and procreates, perhaps the most overlooked bit of imaginative speculation is Scorsese's depiction of Judas as the hero of the film, the most loyal of Jesus's disciples, the one who shakes him from the reverie of Satan's dreamlike "temptation" in order to help him fulfill his destiny. Now, that's a radical idea indeed. Great post, Tony. 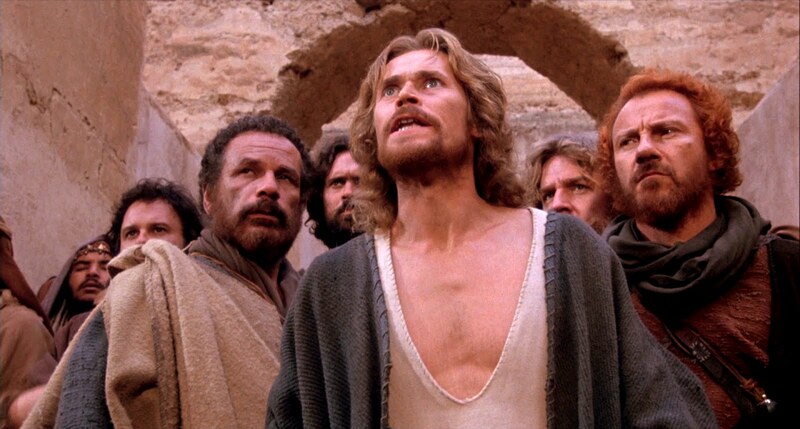 I first saw The Last Temptation of Christ several years ago, and even though I haven't had a chance to rewatch it yet, I'd still say it's my favorite of all the Jesus films I've seen. Not only is it honest about what it's like to struggle as a human, I think it captures better than most the idea that Jesus was either who he said he was, or just flat-out crazy, something which C.S. Lewis writes about. It's unfortunate that it's been the taget of so much villification, but I'm afraid the standard response to perceived "blasphemy" is to act defensively rather than investigate the supposed "blasphemy" to see if there might not actually be some truth there to be discovered. Excellent post for an under appreciated film, Tony. For the longest time, I've had issue with Judas being the ultimate traitor in theological terms or history. If Jesus is to become who he is in Christendom, the passion he must suffer, his death, and finally his resurrection, someone has to turn him in. Whether that is a betrayal or part of the plan, it must happen. If it is part of God's plan, Judas is fated to do it. Where is the disloyalty if he has no free will in the first place, as he does this in His accordance? For Judas doing his part, is he sacrificing his immortal soul in carrying out God's scheme for kicking off something that will by the end save the souls of humankind? If yes, the big guy doesn't give a heck of a lot to the poor soul doing his bidding if he leaves him roasting in Hell for sticking to the plan. If no, then it's Christendom doing a disservice to Judas in labeling him a traitor for holding up his end of the bargain. Just a thought. Great reading. I have a question. You say that the idea of Judas portrayal in the film seems to be based on the gospel of Judas, however the film is based on a book written long before the gospel's discovery, in 1953. Isn't that a bit puzzling? "The Judas of THE LAST TEMPTATION OF CHRIST, as written by the source novel's author, Nikos Kazantzakis (and adapted for the screen by Paul Schrader), is more complex. His personality seems informed by an idea originating from the Gospel of Judas, a Gnostic gospel which posits that Judas should not necessarily be reviled as a traitor." The key clause here is "...as written by the source novel's author, Nikos Kazantzakis (and ADAPTED FOR THE SCREEN BY PAUL SCHRADER)..." Schrader minored in theology and has kept up with discoveries like that of the Gnostic Gospels. So while I'm not certain that Judas is presented exactly as he was in Kazantzakis novel (which I haven't read), I am familiar enough with Schrader's research methods to surmise that this discovery very likely colored the characterization of Judas in the film.